At the front end of every new investment we hope we’ve found the next break-out company. But it’s rare when you have the feeling that you’re investing in a business that may both be that and has the potential to touch millions of lives. We feel we’ve found that in Ello – a social networking business that’s part Twitter, Tumblr, and Facebook, but at the same time all its own. Ello is a beautiful and easy to use product that allows people to express themselves as they see fit but without relying on selling its users to make money. We’ve just led the Series A financing for the business along with Bullet Time Ventures and FreshTracks Capital. As part of the financing, I’ll be joining the Ello board. You can find the Foundry post about this investment here, and a post from Mark Solon of Bullet Time Ventures here. Before I go any further in talking about my thoughts on this investment it’s important for me to state unequivocally my support (and Foundry’s support) for Ello’s manifesto to build a company that doesn’t rely on advertising or the selling of user data. We’ll either figure out a sustainable business model that doesn’t rely on compromising these values or we won’t have a business. 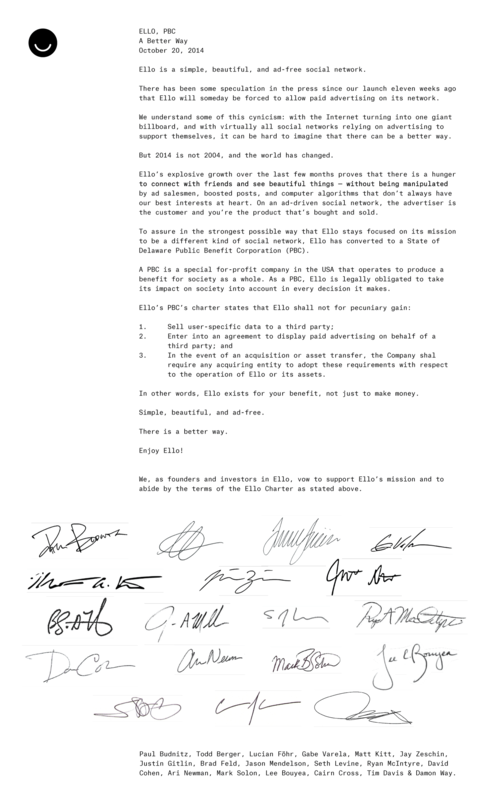 Below is the mission statement that I’ve signed – along the Ello founders and all other investors – making our intentions around this completely clear (you can click on the image below to see a larger version). Along with the financing we’ve also reincorporated Ello as a PBC (public benefit corporation). PBC is a relatively new concept and this is Foundry’s first PBC investment. The idea is reasonably simple – being a PBC allows us to write into our Charter (the founding document of our business from a legal perspective) that we exist to serve not just our shareholders, but also to uphold specific values. In this case we’ve included in our charter a prohibition for selling advertising and user data. While the charter is an agreement among and between the shareholders of Ello, we took the unusual step of essentially restating our mission in our charter because we wanted to emphasize our commitment to building a business on these terms. I suppose it’s easy to be skeptical about these claims – or for that matter, the fact that Ello has investors in the first place. And perhaps nothing I say here will allay the concerns of those who are looking to take shots at something that is gaining momentum and excitement in popular culture (and it might even be a mistake to try to defend Ello and our involvement with it from those that would prefer the company fail). I know plenty about selling advertising on the internet – we have many portfolio companies that help publishers do this (or that are publishers themselves and who make money selling ads). I’m on the board of several of them (you can see the full Foundry portfolio here). And I’m sure those that want to view this financing negatively will point to these companies as evidence that Ello has somehow sold out or they’re bound to change their business model and lose their way in the pursuit of cash. Simply put: this isn’t the case. To be clear, Ello is a for profit business. They plan to make money to support the costs of developing and growing the business. They raised this round to support those efforts. I’m confident the team will develop a profitable business model that supports our investment. This wasn’t a charitable investment by Foundry; our mandate is to make money for our investors and we believe that our investment in Ello will help us do that. One of the things I’m most excited about Ello is Paul Budnitz, Ello’s co-founder and CEO (and the founder of Budnitz Bicycles and before that Kidrobot). I’ve known Paul for 7 years, and over on the Foundry blog talk a little about how we first met Paul, and the singular position he holds in the history of Foundry. I love Paul’s passion and his creative instincts as well as his singular pursuit of his ideas. Creative Genius is a term that’s thrown around much too loosely in our industry, but Paul truly is. He has a visceral passion for Ello and is unstoppable in his quest to create a place for people to interact with their friends that puts users first. 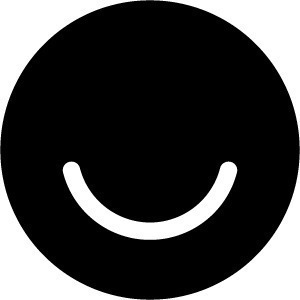 It would be easy to dismiss Ello – a new and of late extremely popular social network – as either a flash in the pan or as too idealistic in their mission to stay true to it. But from our perspective Ello is on the cusp of something huge and potentially game changing. And our belief is that they’ll be successful because of their mission, not in spite of it. You can find me on Ello at @sether.